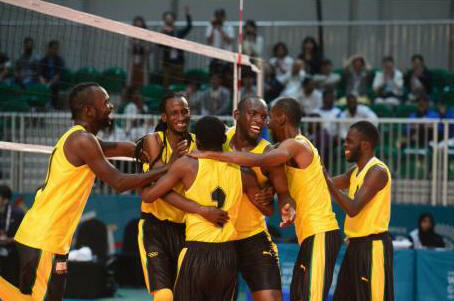 ABU DHABI – The Male and Female Volleyball Teams representing Jamaica at the Special Olympic World Summer Games recently concluded in Abu Dhabi won gold and silver medals, respectively, in their categories. Coaches Loran Grant and Allan Leavy had the chance to guide the teams to podium positions in the volleyball competition. The Male team consisted of Kemar Barrington Walcott, William Lewis, Andre Stefan Sadler, Garth Alphanso Anderson, David Gobern, Andrew Fitzroy Harris, David Caswell Duncan, Gary Orlando Hayles and Orville Spaulding. The members of the Female team were Michelle Campbell, Joan Grace Edwards, Latoya Norida Guy, Rickel Hall, Roslyn Bell Myles, Lorraine Nordia Strachan, Latoya Kimberley Turner, Cellina Brown Junneil Bond and Tracey Ann Parkins. The Jamaican delegation of 98 persons to the Special Olympic was the largest from the Caribbean, and was comprised of 73 athletes, 22 coaches, two officers, and one medical doctor.